In Vancouver, a streetcar operates between Granville Island and Olympic Village during the Olympic and Paralympic Games. When I was living in Paris region, I had the opportunity to take a streetcar for a few months and it had convinced me of the streetcar’s usefulness in a city. 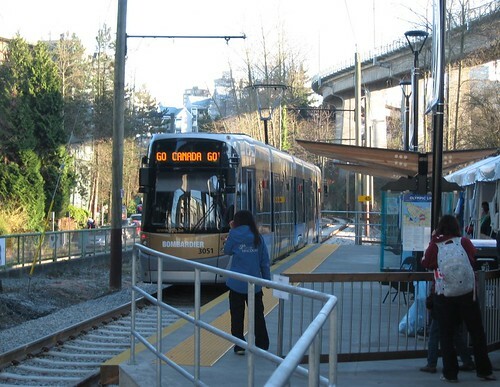 To my mind, streetcar combines subway’s reliability with bus’ friendliness. The Vancouver Olympic line is free until March 21 2010. At the height of the Olympic Games, there was a long line at each station but I was able to take it when it was less busy. My opinion is lukewarm: the streetcar is slow and noisy, seats are uncomfortable and interior space is not optimized. But those defects can be corrected. The real bad news is that the streetcar won’t last longer than the Paralympic Games in the absence of funding. I finds it is a little sadistic: we get used to a convenient and not much polluting mode of transport and then it will be suddenly suppressed. This entry was posted in Canada and tagged Vancouver by ApollineR. Bookmark the permalink.